The HCOE Professional Development portal lists all kinds of trainings for educators. Look for the VAPA Arts Icon (left) next to events for arts educators. Arts Integration is the home of 3 federal arts grants serving our county and region. The first: North Coast Arts Integration Project (NCAIP) served Eureka City and Klamath-Trinity Schools. The second: Create Humboldt serves Eureka City Schools, Klamath-Trinity Schools, Arcata, and Fortuna Schools. The third: Arts & Creativity Initiative (ACI) serves Humboldt, Del Norte, Lake and Mendocino Counties. This website is the home to all of the resources, lessons, blogs, and more of the arts integration projects begun in 2014 and continuing until 2022. Free Arts Integration Lesson Plans — These samplings are some excellent Arts Integration lesson plans to give your program a boost. Free for arts and classroom teachers to use, there are over 50 lesson plans to choose from for grades Kindergarten through High School. Touching on topics from fractions, poetry, the scientific method, history and Green School initiatives, these lessons are a perfect way for you to get started with arts integration, or to enhance a program you already have in place. The Theatre Education Database (TEDb) hosted by the Department of Theatre and Media Arts (TMA) at Brigham Young University. 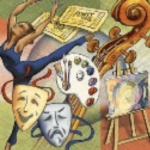 This website is designed to help public educators who are currently teaching theatre in the school systems to cultivate stronger classroom curriculum and lesson plans. The Incredible Art Department was born in November, 1994. It is one of the oldest art and education websites on the Internet. The site began as a showcase for elementary art students in a school in Indianapolis and has grown to serve the international community. Crayola provides Common Core Arts Integrated lessons and the opportunity to purchase their products, of course.